How do you envision the future of architecture? In the spirit of architecture’s fortune telling abilities, we’ve put together a list of our favorite contemporary designs that shed light on the future of our visual world. Behold, 14 designs that show the architecture of tomorrow. The rendering won an international competition associated with a new public park in the area last year, and the project is currently under construction. “The construction with the intersecting connections is based on the principal of the Möbius ring,” states Michel Schreinemachers on the NEXT website. “On the other hand it refers to a Chinese knot that comes from an ancient decorative Chinese folk art,” John van de Water adds. This image of an 80-story skyscraper, imagined by Dynamic Architecture‘s David Fisherback in 2008, is a far-fetched rendering fit for Dubai’s future rich and famous. Why? Because it rotates. The enormous, towering building would have floors that move ever so slightly, completing a 360 degree rotation every 90 minutes. Forget about fighting for an east-facing apartment, the suites in Dynamic Architecture’s creation would have all four cardinal directions covered. And it get’s better. The building would be equipped with several giant wind turbines that generate electricity for tenants, and penthouse residents would be able to park their car at their apartments thanks to nifty lifts. While we’re not sure this design will ever actually come to fruition (it was scheduled to be up and running in 2010), it’s certainly a visual feast worth ogling. But there’s also the shorter, less flashy structure (pictured above) designed by New York-based architecture firm stpmj. The parallelogram-shaped barn would be made of wood and sheeted with mirror film, at a cost of $5,000. The idea is to “blur the perceptual boundary” between object and setting, according to a statement sent by the architects to The Huffington Post earlier this year. We have to say we’re impressed with architects’ ability to push the boundaries of what invisible really means. For his series “Dauphin Island,” artist Dionisio González designed dreamlike, futuristic forts made from iron and concrete, fusing the role of artist with that of architect, engineer and urban planner. The peculiar edifices — the hybrid of a beach house, a bunker and a space ship — were designed with the residents of Dauphin Island in mind. Located off the coast of Alabama in the Gulf of Mexico, the tiny landmass is known for experiencing perpetual and catastrophic hurricanes. When a storm hits the small island of around 1,200 people, it often washes away much of the coastline, leaving residents to rebuild their homes again and again. González created hypothetical blueprints for his forts, illustrating how his bulbous, concrete structures would better suit the fraught island’s populous. You can learn more about the project on his website. Keep in mind, these structures are not yet slated for reality, but they certainly paint an interesting picture of what futuristic island homes could look like. Dubai’s Burj Khalifa is widely known as the world’s tallest building, measuring in at a whopping 2,716.5 feet and 160 stories. The structure itself is mesmerizing, but what’s even more intriguing is a think tank’s bizarre proposal to cover the towering skyscraper in a giant fabric casing made of reflective material. 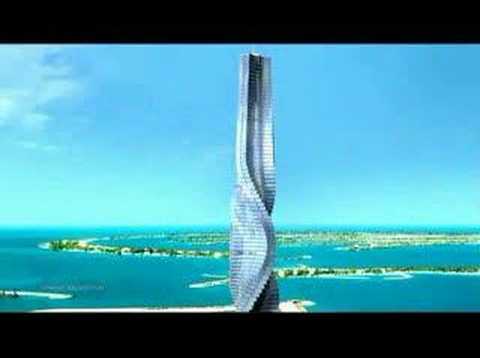 We learned about the project, dubbed EXO-BURJ, in 2014. The strange, sock-like covering would wrap around the entire building, from spire to ground level, in a “super-lightweight, reflective and semi-transparent fabric material,” according to a description by the Dubai-based think tank, OP-EN. The temporary “sweater” would reflect the expansive urban scenes around it, turning the Burj Khalifa into a massive mirror in the vein of Christo and Jeanne-Claude. What is there to do with an outdated, eyesore of a power plant in the future? Why not give the sprawling facilities a green makeover, one that would serve two functions: to beautify the structure and provide a new way of dealing with CO2 emissions. Earlier this year, the Museum of Modern Art and MoMA PS1 selected The Living’s “circular tower of organic and reflective bricks” — called “Hy-Fi” — as the winner of the Young Architects Program’s (YAP) 15th edition. The temporary structure will be built using a new method of bio-design incorporating entirely organic material. Forget interior decorators, the future of indoor design will be run by 3D printers. We have architects Michael Hansmeyer and Benjamin Dillenburger to thank for introducing us to this concept. The two pulled off a three-dimensional printing feat to rival them all just last year. As part of the project “Digital Grotesque,” the duo 3D printed an entire room, creating a 16-square-meter cube adorned with unbelievable ornamentation that looks like it belongs in a futuristic cathedral. It’s hard not to love this New York design project from Family and PlayLab, which plans to bring a giant filtration system to the murky waters between Manhattan and Brooklyn. The project would take the shape of a 164-foot long floating pool set to take shape in 2016 — if all funding efforts go as planned. If there are swimming pools in our future, let them look like this. In a statement released at the end of 2013, pool masterminds Archie Lee Coates IV, Dong-Ping Wong and Jeff Franklin announced they are beginning construction on Float Lab, an experimental version of the planned 164-foot +POOL. They raised the funds for the smaller pool (35 feet by 35 feet, to be exact) through their last Kickstarter endeavor. With a launch date planned for this summer, the mini pool will put the team’s filtration membranes to the test in real-river conditions. From the outside it resembles a giant, plushy purple jelly bean, and on the inside it looks more like a glowing, colored seashell. But this balloon-like form is actually the world’s first inflatable concert hall, entitled “Ark Nova.” Iconic British sculptor Anish Kapoor and Japanese architect Arata Isozaki teamed up to create the structure, meant to tour through areas of Japan affected by the 2011 earthquake and tsunami. It’s a novel idea that could make for an innovative design strategy in many other fields. While wooden skyscrapers might not be as sensational as the previously mentioned rotating tower, the idea of building 34 wooden stories on on top of the other is pretty astonishing. And it might become a reality if Scandinavian practices C.F. Møller Architects andDinnellJohansson – 2013′s winners of the HSB Stockholm architectural competition — follow through with their rendering for the world’s tallest wooden skyscraper. The design (pictured above) is one of three ”ultra-modern residential high-rises” planned for Stockholm’s city center in 2023, but the catch is, only one of these proposals will actually be built. It’s no secret that New York’s Gowanus Canal is a breeding ground for toxic waste, polluted runoff, and raw sewage that’s — rather unfortunately — been dumped directly into the area’s bodies of water. But a little project known as “Sponge Park” is hoping to transform the Brooklyn locale into a cleaner, properly filtered sanctuary — and provide a model for future urban design. The Gowanus Canal Conservancy and the landscape architecture firm dlandstudioannounced in the summer of 2013 that they plan to employ a system of landscape buffers and remediation wetlands to slow, absorb, and filter Gowanus’ polluted sewer runoff before it reaches the canal. So, not only will the Sponge Park turn 11.4 acres of contaminated fields into a pleasant waterfront arena, it will provide a means of absorbing harmful pollutants that continue to ooze into the industrial battlefield. In 2014, Chinese architecture firm MAD unveiled renderings of Chaoyang Park Plaza, a center of skyscrapers, office blocks and public spaces meant to mimic the appearance of mountains, hills and lakes depicted in Chinese landscape paintings. The complex is now under construction in Beijing, and will result in an expansive sky line seemingly ripped from the pages of a futuristic novel. Lucky for Beijing, the innovative skyline is already under construction.